Coursera is the world’s largest provider of Massive Open Online Courses (MOOCs). It enables its learners to learn more efficiently & faster and it provides all these at a very manageable price. You can now join any of over 1,700 courses and Specializations available at Coursera. And learn skills that’ll help you succeed both professionally and personally. Lets take a look at its most popular specializations. 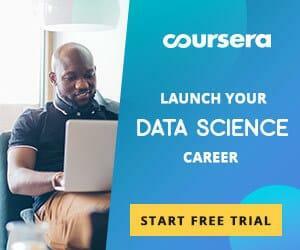 Coursera provides both free and paid options. You can take any course for free but to get a certificate you must have a subscription. Deep learning is currently one of the most in-demand skills in tech, Deep Learning is what you should opt for if you want to break into AI. This specialization consists of five courses. You will learn the foundations of Deep Learning. You will gain a deep understanding of neural networks building, and learn how to lead machine learning projects. You’ll learn about RNNs, Convolutional networks, LSTM, Dropout, Adam, BatchNorm, and more. You will work on case studies from autonomous driving, healthcare, sign language reading, natural language processing and music generation. You’ll learn how it is applied in industry, and will practice all these ideas in in TensorFlow and Python, which will be teached to you. Also you’ll get career advice from many top leaders in Deep Learning. After finishing this specialization, you’ll understand how to apply Deep Learning and build a career in AI. Python is definitely one of the most in demand programming languages. Building on Python for Everybody course success. This Specialization introduces fundamental programming concepts including networked application program interfaces, databases and data structures using the Python programming language. You’ll use the technologies learned throughout its five courses in the Capstone Project, to create and design your own applications for the retrieval of data, its processing and visualization. The Data Science Specialization covers the tools and concepts that’ll be required from you in the entire data science pipeline, from asking the right questions, making inferences and to communicate results creating visualizations. Using real-world data you’ll build a data product by applying your learned skills in the final Capstone Project. To demonstrate your mastery of the material you’ll get a portfolio at completion. This skills-based 5 courses specialization introduces its learners to data science through the python programming language. Intended for learners with a basic programming or python background, and want to apply machine learning, statistical, information visualization, social network analysis and text analysis techniques through popular toolkits of python such as matplotlib, pandas, scikit-learn, networkx, and nltk to gain insight into their data. In this Specialization, you’ll learn how to formulate data questions from business challenges. You’ll use powerful methods and tools such as Tableau, MySQL and Excel to analyze data, create models and forecasts, communicate your insights through designing visualizations. This Specialization provides you with an understanding of insights provided by big data through hands-on experience. Understand the systems and tools used by big data engineers and scientists. No programming background is required. You’ll learn the basics of using Hadoop with Spark, MapReduce, Hive. and Pig. You’ll learn how to perform leverage graph analytics and predictive modeling to model problems by following along with the provided code. Offered by the University of Illinois, Digital Marketing is a part of the iMBA. A fully-accredited, flexible online MBA, this specialization was among the top 10 in 2016 in terms of enrollments on Coursera. Its first course, Marketing in a Digital World has over 150,000 learners and is among the Top 50 MOOCs of All Time as rated by Class Central. Here is a complete and current list of all Top Coursera specializations >>.